We had another wedding in our family this past Sunday -- my cousin's daughter was married. Her colors were pink, white and navy blue. I made this card for the new couple. I really like using these birds for a wedding card. They're from Celebrate with Flourish. 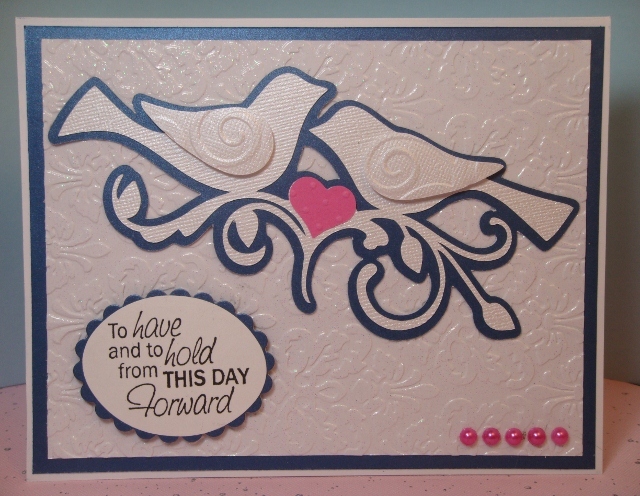 The plain oval was made using a punch, and the scalloped oval with a Spellbinders die. Background glitter paper was embossed with Kassie's Brocade, and I used Divine Swirls on the doves wings. The stamp is from a Fiskars Wedding set. This is beautiful Pat!! Love the cuts and the sentiment!! The whole design is stunning and I know the bride and groom will LOVE it!!! Your card is just LOVELY! !Beautiful Embossing!Love it!A very Beautiful Card! !The couple will love it! so pretty love the color and the beautiful embossing! Such pretty colors for a wedding. How many more relatives do you have that are going to be getting married?!?! Beautiful card Pat, love the embossing. Such great colors for a card and a wedding! Awesome wedding card!! The birds are so whimsical and I love the embossing, what a beautiful touch-pretty sentiment too! !